Spring Special-Stay 3 nights, get the 4th FREE! Gulf Front Views! Shuttle & Free Wifi Included! No Golf Cart Available. Please take time to visit & explore Platinum Vacation's Recently Updated Website! 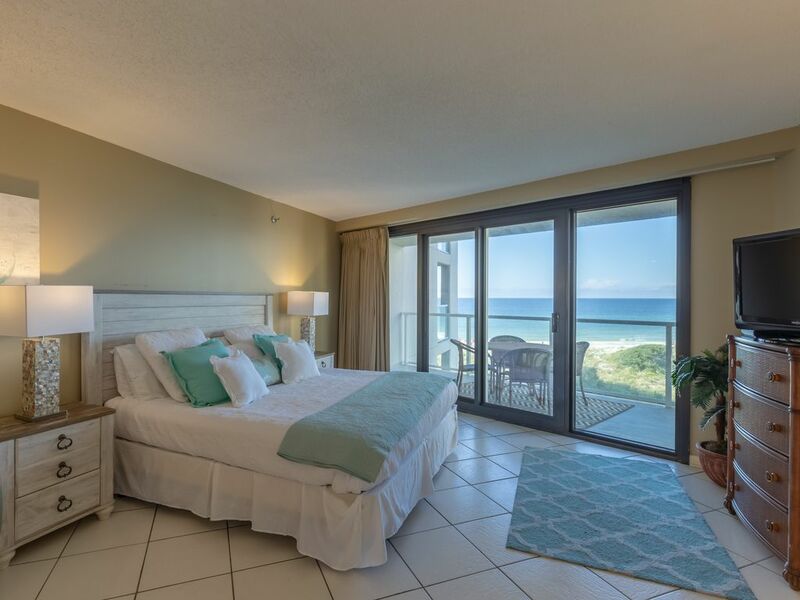 Enjoy amazing Gulf-Front views from this designer furnished fourth-floor studio condominium at the Sandestin Golf & Beach Resort -- Beachside Two on the 4th floor. full all-white kitchen, dining area and living area with a queen sleeper sofa and over-sized chaise lounge. The condo offers tile floors throughout. The fully-equipped kitchen and bath have been recently renovated and are bright and inviting. This unit is very sunny since it has more windows than the average studio condo. For added convenience, a washer and dryer is a welcomed feature. The private balcony with newly installed glass balcony railings overlooks the Gulf of Mexico and offers spectacular views of the sparkling water and shimmering white sand. You are on the 4th floor so the views are wonderful. The building offers its guests WiFi, a seasonally-heated solar pool with grills at the pool deck,an exercise room and covered parking. You are only steps from all the amenities of the resort which will make your vacation memorable. On those nights you want to enjoy an evening out, the Village at Baytowne Wharf offers an array of restaurants from fine dining to pizza, sushi and more. Or catch the latest movie at Grand Boulevard at the new ten-screen cinema. Sandestin's 2400 acres has over five miles of paved trails for jogging and bicycling, a nature walk area, three public golf courses and tennis courts for the tennis enthusiast. My husband and I had a nice stay in this clean studio. However, this unit does not have a well equipped kitchen - some pots/pans and utensils/plates but absolutely no cooking staples like salt/pepper, sugar for coffee, oil, etc... Basics like that would have made it possible to cook even a quick breakfast. So do not plan on being able to cook at all unless you want to buy it all. Also, this building is very dated - worn hallway carpets, elevators and pool area in need up sprucing up. The unit, while clean, is in need of major updating as well. Throw carpets need cleaning or replacing. Shower stall with mildewy door dams. Patio furniture basic and a small side table needs to be thrown out as it is literally falling apart. We were disappointed but enjoyed the view and convenient location for beach access. Decent rental for the price. Location was perfect but room was just that, a room. Pictures made it appear to be a separate bedroom, but it was a studio. Difficult with everything in same space. Would not recommend for families with more than one child. Beautiful beaches. Very busy, but gorgeous. The studio apartment was perfect for the 4 of us. Great location, clean condo, easy access to other activities, beach front property, everything was super great...even the weather! Will stay again! I give you 5 stars! *****! Excellent stay!